So, it's Bean's birthday today ... I'll have to phone him in a bit to wish him. He's in Cape Town at the moment enjoying a bit of a holiday before he heads off to his new single life in the UK. Weird. I'm sure I'll be quite emotional after chatting with him ... depending on how long the call lasts. But right now, I'm fine. Righto, I'm back ... Last night was very quiet. I missed my second yoga session, I was 5 minutes late ... damn Jhb traffic :P Oh well. Loulou and I are definitely going this evening :) So just had a fairly relaxing night at home. On the retrospective reporting, I finished two books on the Easter weekend. 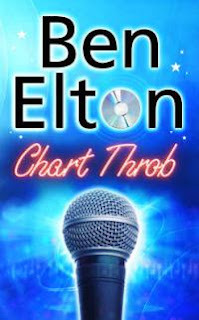 First was Ben Elton's Chart Throb. "Chart Throb" is the ultimate pop quest. Ninety five thousand hopefuls. Three judges. Just one winner. And that's Colin Simms, the genius behind the show. Colin always wins because Colin writes the rules. But this year, as he sits smugly in judgement upon the mingers, clingers and blingers whom he has pre-selected in his carefully scripted 'search' for a star, he has no idea that the rules are changing. The 'real' is about to be put back into 'reality' television and Colin and his fellow judges (the nation's favourite mum and the other bloke) are about to become ex-factors themselves. Ben Elton, author of "Popcorn and Dead Famous" returns to blistering comic satire with a savagely hilarious deconstruction of the world of modern television talent shows. "Chart Throb" is about one winner and a whole bunch of losers. It was okay. I appreciated it more when I caught a bit of American Idols on tv last night. It wasn't nearly as good as I remember High Society being. 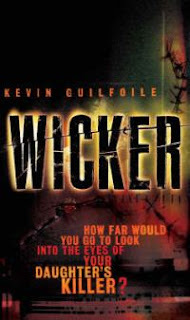 The second was Wicker by Kevin Guilfoile. When his teenage daughter is killed, and no one is arrested for the crime, Dr. Davis Moore does the unthinkable: he clones the unidentified murderer from the genetic evidence and has the child adopted by an unsuspecting couple, the Finns, who name him Justin. With his partner as Justin's pediatrician, Moore is able to follow the child's development, hoping to eventually identify the killer through their similarities. But that's not as easy as it sounds. This was brilliant. I thoroughly enjoyed it and it had a lovely twist, a couple actually, at the end that even I didn't see coming. If you like murder mystery, read this one.